"Lost+ / Viva la Vida (Live At the 51st Annual Grammy Awards)"
(2008) "D.O.A. 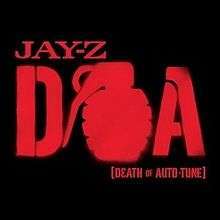 (Death of Auto-Tune)"
"D.O.A. (Death of Auto-Tune)" is a song written by American rapper Jay Z. It was produced by No I.D. The song was released as a digital download on June 23, 2009, and as the first single from Jay Z's 11th studio album, The Blueprint 3. The song made its world premiere on the New York radio station Hot 97 on June 5. Its lyrics address the overusage of Auto-Tune in the music industry. The song samples "In the Space" by French composer Janko Nilović. The bridge is inspired by Steam's "Na Na Hey Hey Kiss Him Goodbye" and interpolates lyrics from Kanye West's "Big Brother", and "You're Nobody (Till Somebody Kills You)" by The Notorious B.I.G.. The song won Jay Z his eighth Grammy Award, and his second for Best Rap Solo Performance. Before making "D.O.A. (Death of Auto-Tune)", Kanye West and Jay Z had recorded an Auto-Tune song. However, Kanye heard the instrumental by No I.D. and thought about making an anti-Auto-Tune song. They then removed all the songs that contained Auto-Tune from The Blueprint 3 to further their point. Jay Z himself stated that the point of the song was to "draw a line in the sand", saying that while he appreciated the use of the Auto-Tune by artists with an ear for melody like T-Pain and Kanye West, far too many people had jumped onto the technology and were using it as a crutch. One of the partial inspirations for Jay Z to write the song was hearing Auto-Tune being used in an advertisement for Wendy's fast-food chain. It made him feel that what was once a trend had become a gimmick. The title is also a reference to the medical term "D.O.A." or "Dead on Arrival". The song makes a reference to The Notorious B.I.G. song "You're Nobody ('Till Somebody Kills You)". Jay Z sampled a portion of The Notorious B.I.G. 's freestyle "Wake Up Show Freestyle". On June 27, 2009, a trailer for the video was released. The music video (directed by Anthony Mandler) was shot and aired immediately after the 2009 BET Awards on June 28.The video shows Jay in scenes such as a deserted factory building, a bar with a band, and playing card games in a kitchen. Actor Harvey Keitel cameos in the video as a card player in the kitchen of New York's exclusive restaurant, Rao's. Basketball player LeBron James also makes a cameo appearance. The video was nominated for Best Male Video and Best Hip-Hop Video at the 2009 MTV Video Music Awards. It did not win either of the categories, losing to T.I. 's "Live Your Life" and Eminem's "We Made You" respectively. The video ranked at #17 on BET's Notarized: Top 100 Videos of 2009 countdown. On August 31, 2009, the music group, Bone Thugs-n-Harmony recorded a remix of the song. It was released officially on their MySpace page. The song includes the 5 united members singing separate verses along with Jay Z singing the original chorus. The song has also been remixed by rappers such as Lil Wayne and Asher Roth. The song was ranked best song of the year 2009 by MTV. Time magazine ranked it number 8 on their list of the best songs of 2009. Two days after the song premiered on Hot 97, Jay Z made an appearance at the annual Summer Jam concert at Giants Stadium and performed the song live for the first time. Towards the end of his set, he was surprised by the appearance of T-Pain who joined him onstage. He later performed "D.O.A. (Death of Auto-Tune)" during the 2009 BET Awards. The song made a "Hot Shot Debut" at #24 on the Billboard Hot 100 based on downloads. It has also reached the top 50 of the Hot R&B/Hip-Hop Songs, peaking at #43. 1 2 Schwartz, Barry (2009-06-06). "Jay-Z Premieres New Song, 'D.O.A. ': 'Death Of Auto-Tune'". MTV. Retrieved 2009-06-21. ↑ Hart, Ronald (2009-06-10). "D.O.A. (Death of Auto-Tune)". Billboard. Nielsen Business Media, Inc. Archived from the original on June 24, 2009. Retrieved 2009-06-10. ↑ Reid, Shaheem (2009-06-30). "Kanye West Promises Jay-Z's 'Anti-Auto-Tune' Blueprint 3 Will Be 'Amazing'". MTV. Retrieved 2009-07-17. ↑ Shaheem, Reid (October 2009). "Jay-Z Blames Wendy's Commercial -- Partially -- For His 'Death Of Auto-Tune'". MTV. MTV Networks. Retrieved 2009-06-10. ↑ "Jay-Z Caught Stealing Biggie Ryhmes...Again!!!". YouTube. 2009-09-17. Retrieved 2012-02-12. ↑ "Jay-Z "D.O.A." Trailer". Youngandthefly.com. Retrieved 2012-02-12. ↑ Death Of Autotune Kellz My Response Accessed 2009-06-09. ↑ "DJ Webstar, Ron Browz & No ID Discuss Jay-Z's, "Death Of Auto-tune"". RealTalkNY. ↑ "Lil Wayne on Jay-Z's 'D.O.A.' Track: 'Auto-Tune Ain't Dead … T-Pain Is My Dude'". ↑ "The Best Songs Of 2009, In Bigger Than The Sound - Music, Celebrity, Artist News". MTV. 2009-12-09. Retrieved 2012-02-12. ↑ "The Top 10 Everything Of 2009". Time. 2009-12-08. ↑ Shaheem, Reid (2009-06-08). "Jay-Z Makes Surprise Appearance At Summer Jam". MTV. MTV Networks. Retrieved 2009-06-09. ↑ Archived March 14, 2009, at the Wayback Machine. ↑ "Top 100 Music Hits, Top 100 Music Charts, Top 100 Songs & The Hot 100". Billboard.com. Retrieved 2012-02-12. ↑ "D.O.A. (Death Of Auto-Tune)" (Hot R&B/Hip-Hop Songs chart), Billboard, June 21, 2009.